Using state-of-the-art Swiss Light Source Synchrotron at the Paul Scherrer Institute PSI, the company has pushed the level of detection boundaries down to 0.01 wt%. X-Ray Powder Diffraction (XRPD) is a powerful technique that exploits the interaction between X-rays and matter to study the structural and microstructural properties of materials. Its power relies in the direct and unique relationship between the X-ray powder diffraction pattern of a given substance and its structural order and/or disorder. In a powder diffraction pattern, the distribution of the diffracted intensity as a function of the scattering angles uniquely identifies a crystalline form [Ivanisevic et al, 2010] and, provided that sufficient resolution in real space is achieved, it might identify nano-crystalline and amorphous forms as well [Davis et al, 2013]. In the field of pharmaceutical powders, XRPD is considered the gold standard method for identifying and quantifying crystalline solid forms (i.e. polymorphs, hydrates, solvates, salts, co-crystals, amorphous). However, it is the quality of an XRPD pattern that defines the accuracy and reliability of the technique and, therefore, the wealth of information that can be extracted. When it comes to data quality, nothing competes with Synchrotron X-Ray Powder Diffraction (SXRPD), which is far superior to laboratory XRPD in terms of angular resolution, counting statistics, energy tunability and fast acquisition time, especially when combined with new generation, solid-state, ultra-fast and efficient detectors. Excelsus Structural Solutions' activities are based on both its access to advanced synchrotron facilities and its own competencies in the field of synchrotron XRPD instrumentation and technique: these allow the Excelsus team to offer state-of-the-art analytical services to its industrial customers. As early as 2013, Excelsus Structural Solutions succeeded in directly detecting and quantifying traces of API (active pharmaceutical ingredients) in pharmaceutical mixtures smaller than 0.05 wt% (percentage by weight) [Gozzo, 2013], which indeed constitutes the core of its activities. By optimizing the beamline optics, the Excelsus team was recently able to push the lowest limit of detection (LoD) much further and hit 0.01 wt%. Figure 1 shows the sequence of synchrotron-XRPD patterns recorded on ad-hoc mixtures of salicylic acid and ACP (paracetamol) API, both of which are API: the lowest LoD of 0.1 wt% of the salicylic acid/paracetamol mixture achieved with conventional optics set up was improved to 0.01 wt%, i.e. by a factor of 10, by the careful optimization of the beamline optics, reaching – to the best of our knowledge – unprecedented direct detection via XRPD of pharmaceutical minority phases in mixtures. 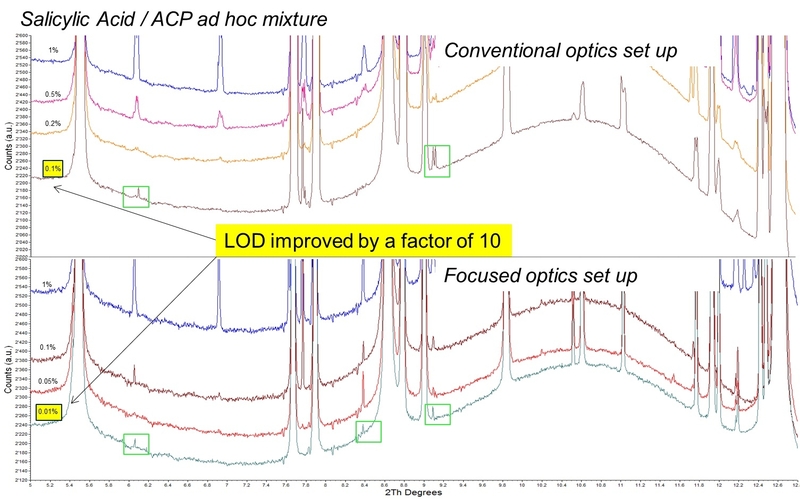 Figure 1: Synchrotron-XRPD patterns recorded on ad-hoc mixtures of salicylic acid and paracetamol (ACP) Active Pharmaceutical Ingredients: the lowest LoD of 0.1 wt% of salicylic acid/paracetamol mixture achieved with conventional optics set up was improved to 0.01 wt%, i.e. by a factor of 10, by the careful optimization of the beamline optics. This allows Excelsus to offer the pharmaceutical industry some unique analytical services, especially in the field of intellectual property rights protection and the early detection of impurity polymorphic phases during stress tests. At such a limit of detection, the statistics of orientation of the minority phase crystallites strongly depend on crystallite size and it is intrinsically reduced. Excelsus' team is presently working on the development of new experimental and analysis approaches that will improve the overall accuracy and precision of quantification in such challenging circumstances. Ivanisevic I., McClurg R. B. and Schields P. J.: Uses of X-Ray Powder Diffraction in the Pharmaceutical Industry, Pharmaceutical Sciences Encyclopedia: Drug Discovery, Development and Manufacturing, Ed. by Shayne C. Gad., p. 1-42 (2010). Davis T., Johnson M. and Billinge S.J. L. "Toward Phase Quantification at the Nanoscale Using the Total Scattering Pair Distribution Function (TSPDF) Method: Recrystallization of Cryomilled Sulfamerazine", Cryst. Growth Des. 2013, 13, 4239−4244.